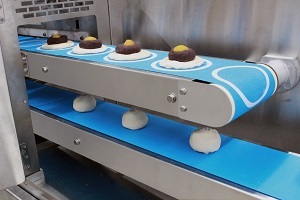 Flex Encruster automates hand wrapping work of sweet bean paste buns, curry buns, chinese steamed buns, and other products. 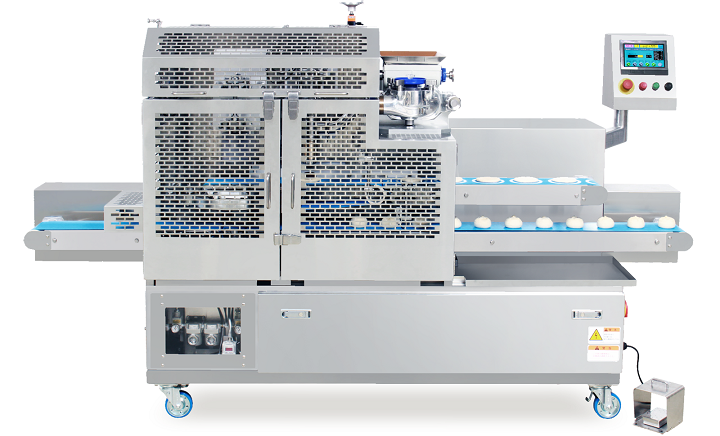 "Flex Encruster" automates "Encrusting Process" of filled sweet breads, Chinese Steamed Buns, and many other filled products. Place the circular, flat dough pieces on the upper conveyor and step on the foot switch. 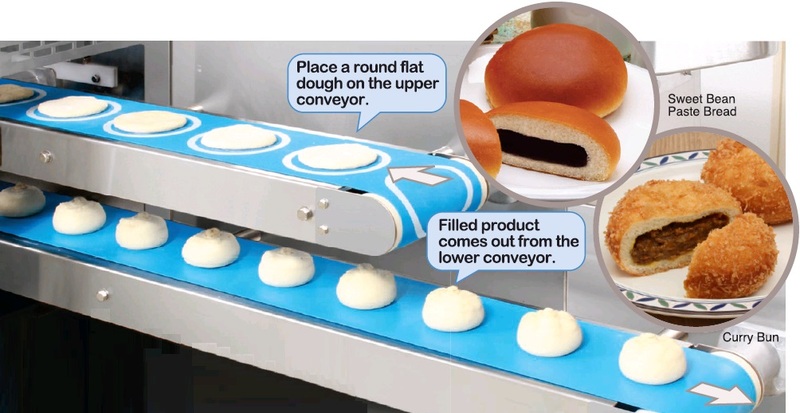 Automatically wraps the dough around the filling and discharges the products from the lower conveyor. Adopted "Easy to see Easy to use" color touch panel. Furthermore, the built-in Product Memory Unit (P.M.U.) stores and recalls the production parameters. Inexperienced person can easily produce filled products. Discharging direction is selectable from right or left. Dough pieces with hand deposited filling can be processed for the optimum production of the small quantity products. Quick product changeover and easy cleaning. Square, flat dough can be processed. It also expands your product range: unique various products such as with two fillings and/or solid ingredients. A great amount of filling can be wrapped into the product. Filling depositing device (depositor) can be switched on and off. By hand-depositing the filling beforehand, high value added products such as sweet bean paste buns with whole chestnut can be produced. Open top product shapes also can be produced. *Production speed and weight range varies depending on the material. Please make sure by running your own materials.